Future dates have not yet been set, but we are excitedly waiting on the Lord at the moment. So stay tuned! Thanks for your prayers! 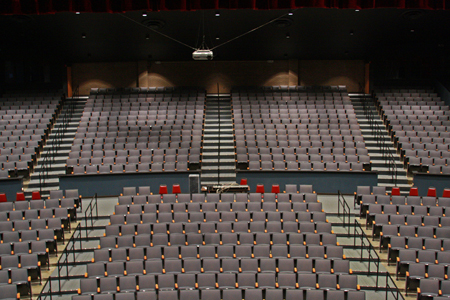 The 2013 event was held on the campus of Johnston Community College in Smithfield, NC at the Paul A. Johnston Auditorium. Event time was 7 PM (ET). Get off at exit 95. Coming from the north, turn right onto US 70 BUS or turn left if coming from the south. Continue along this route and prepare to turn left at the stoplight just beyond the Golden Corral (which will be on your left). You will turn left onto College Rd. and proceed on until you pass the first two campus entrances on your left. The third and fifth entrances on your left will be the event parking lots. Driving along US-70, once you've gone through Princeton, several miles later pass through the Peedin Rd./Creech's Mill Rd. intersection (a BP gas station will be on your right). The next intersection you should turn left onto US-70 BUS (a large sign will be on your right showing US-70 BUS to Smithfield). At this intersection, a boat sales lot, Collins Inc., will be on your left. Once you've turned left, travel on until you cross over I-95. At the third traffic light, turn left onto College Rd. Proceed on as the third and fifth drives to your left will be the parking lots for the auditorium. Whether you took the Clayton Bypass or are already on US-70 BUS, you have the option to simply stay on US-70 BUS all the way to Smithfield. The Neuse River bridge is back open now, so you can continue on through downtown Smithfield. Take note that once you reach the intersection with Sound Station & Security and Rite-Aid both on your left (junction with US-301), you are only about a half-mile from where you should turn right onto College Rd. Once passing underneath the railroad bridge, the next stoplight is for College Rd. The auditorium parking lots can then be accessed from the third and fifth drives to your left. If you wish, instead of taking US-70 BUS, you can stay on US-70 until you reach Selma. Be sure to take Exit 334 instead of US-70 Bypass around Selma. After exiting, proceed on US-70 into town and cross the bridge over the railroad tracks. From there, you can take I-95 South to the next exit, Exit 95, and then turn right onto US-70 BUS. Then turn left at the third traffic light onto College Rd. and enter the parking lot from the third and fifth drives to your left. The same directions apply as to those traveling US-70 Eastbound. NC-210 will merge with US-70 BUS above the Neuse River bridge. From there, proceed on US-70 BUS eastbound, and once you've passed underneath the railroad bridge, which is just past the US-301 intersection, the next stoplight will be College Rd. Turn right there, and the third and fifth drives on your left will be for the auditorium parking lots..